I have a thing for donuts. The person who invented the donut pan to bake donuts has my undying love. Without them, dark chocolate baked donuts, pumpkin spice donuts, and apple pie protein donuts would not be possible. 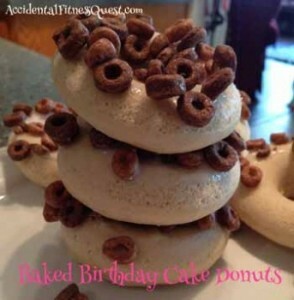 It was only a matter of time before birthday cake donuts entered the picture. Preheat oven to 325 degrees and spray a 6 well donut pan with non-stick spray. Mix all of the donut ingredients in a bowl until well blended. Scoop batter into a ziploc baggie and snip one corner off. Pipe the batter into each donut well until 2/3 full or so. Bake at 325 degrees for 8 – 10 minutes. Remove from oven and cool for about 5 – 10 minutes before removing from pan. Mix the powdered sugar with just a little water to form an icing. Drizzle each donut with the icing and dip them into the chocolate oats to make them stick. Enjoy! 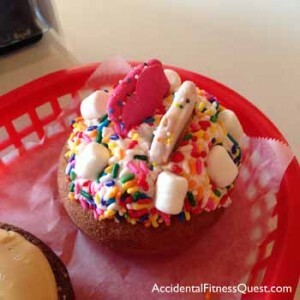 Makes 6 donuts at approximately 142 calories each – 3g protein, 29g carbs, and 1g fat. You don’t have to use the ziploc baggie trick but it makes filling the donut wells so much easier than trying to do it with a spoon. You’ll save a ton of time and get your donuts that much faster. The butter extract really gives these a birthday cake flavor but you can use plain old vanilla extract instead. The cereal I used was a generic brand of Chocolate Cheerios hence my chocolate oat description. You can use the name brand or you can go generic. I’ve always had this donut love from way back when my Mom used to take me to the local Krispy Kreme to watch them make the donuts. It was one of the huge donut shops with conveyor belts and machinery that moved the donuts way up into the air and then back down, cuttin g, frying, glazing. Tons of fun to watch and you got a donut as well. Before I began my fitness quest, I used to have two Krispy Kremes every Friday morning for breakfast. It was my Friday thing. Now obviously my tastes have changed a bit and matured. Oh, I still love donuts and wouldn’t turn down a Krispy Kreme but I’m more into the artisan donuts. These are much rarer and taste so much better. They are typically little shops that handcut the donuts from high quality ingredients and fry them up. Then the owners use their imagination and top them with crazy combinations of things. Just like I do with my own food! BUT this is in donut form. My dream is to one day go to Voodoo Donuts in Portland, OR but until then I can partake of the local artisan donuts every now and then. That beauty above was a cake donut from Hypnotic Donuts in Dallas. It was covered with vanilla frosting, sprinkles, marshmallows, and frosted animal crackers. It was perfection and worth every last bite. It was called Zoo Topia and was Utopia for sure. Needless to say, this can’t be an every day or even an every week thing or my backside would resemble two planets and not in a good way. I was hit with a craving this weekend and baked up my own version of a fancy donut. This was a birthday cake flavored donut with a chocolate oat topping. I managed to Questify it and make it very friendly since it was low in sugar, low in fat, and baked. Pretty creative of me if I say so myself. We’re these donuts as sweet as the Zoo Topia or other donuts, no? But they were pretty darn good for killing a donut craving. Baking them saves a ton of fat and I also cut back the sugar in the donut part. By using less icing and making the cereal topping a little sparse, I was also able to cut a few calorie corners. Feel free to use more icing and cereal if you like. Now I just need to come up with a better name for these babies. Any ideas?